Thirty Nine: Good Yeomen — The Old Town Alchemy Co. It's been busy around these parts recently. The competitions have been coming thick and fast - I've had to submit recipes for or present drinks at comps for Havana Club, 42 Below, Chairman's Reserve, Finlandia and Bacardi, all in pretty short order. Not that it's been a hardship, but it got me thinking that there's often a distance between the drinks you come up with competitions and the drinks you come up with for customers. Meanwhile, the whole time I've been living the mixological highlife, we've been piling up excess stock at work. For one reason or another - choosing different well brands, free stock, whatever - we've ended up with a decent amount of some pretty good products. The problem is that they're not products that we're going to sell a lot of on their own. So, with my thinking hat on, we're instituting a cocktail of the week to showcase the products we need to start selling. I've been competing regularly for about three years now, and competitions seem a lot harder than they used to be. Once upon a time, you could get away with justifying ingredients on the grounds that they were "awesome". These days, every element has to be in the recipe for a reason and has to chime with the base ingredient whilst not overpowering that base. There have always been competitors who put that level of thought and detail into their drinks, but now that philosophy extends much further down the leaderboard. The problem with competition drinks is arises when it comes to selling them. Your use of a whole egg may be motivated by a desire to speak to the heritage of mixed drinks in the pre-cocktail era and to add a rich texture to the drink, but that doesn't really matter if the customer goes, "eww, egg?" and orders a French Martini instead. There's the fact that the tastes of the masses tend to skew towards sweet, bitterness is scary for most customers and the UK's biggest selling cocktail is a Long Vodka - a vodka, lime cordial and lemonade, with a dash of Angostura bitters. But on the other hand, creating a decidely commercial drink is oddly liberating. You don't have to worry about the inspiration behind your drink, or whether a specific ingredient will be acceptable to the competition sponsor, or anything apart from this: does it taste good? Shake all ingredients with ice and fine-strain into a chilled martini glass. Garnish with an apple slice. 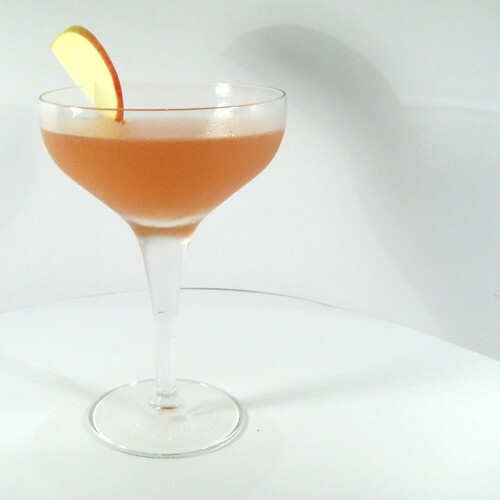 Posted on September 26, 2009 by Jon and filed under Fiftytwo, Mixology, Projects, Recipes and tagged apple juice Beefeater cocktails competitions gin pomegranate syrup.